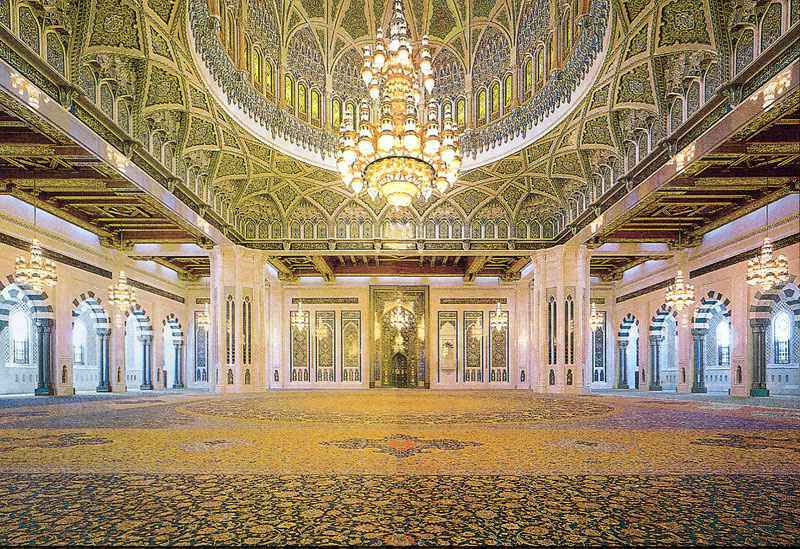 The Carpet of Wonder in the Grand Sultan Qaboos Mosque in Muscat in the Sultanate of Oman is the largest carpet in the world. The previous record holder was a carpet woven in Qum, see below. Gabbeh means unclipped, the term is used to refer to long pile tribal and village rugs. Often times weavers would weave fine tribal rugs for sale and long pile coarser rugs for their own use. Typically the design is less commercial and the pile is longer. Knot counts tend to be low. They seem to have gotten commercially popular in the 1980s and around this time commercial versions started appearing. The oldest of the commercial variety were simple geometric shapes in undyed wool. Tan fields with brown or black designs were common. In the 1990s a handful of men sparked a renaissance of Gabbehs using natural dyed wool and non-traditional designs. These men included The Zollanvaris, the Sobhes, Kasra Massarat, and Jim Opie. Do Smaller Fingers Tie Better Knots? No smaller fingers as in children's fingers cannot compare to the experienced fingers of an older weaver. Who would you hire to paint your house a nine year old or an experienced adult painter. Obviously the child cannot compare to the master. How can you tell a good quality rug? Two basic things that show quality in a rug are small, tight knots and a fine pattern with a clear design on the front as well as on the back of the rug. The wool should feel oily, full of lanolin. It's always best to purchase a rug from someone you trust and from a reputable store. What does "fairly paid adult labor" mean? Most rugs are made by persons at least 14 years and older. Child labor is not a child working along side his parents in the evening after school as a way to learn this time-honored art. Fairly paid refers to the artisans setting a price that they feel adequately compensates them for their work and skill. Completion time depends on the type of rug. As an example, a 9'x12' Persian rug that has 500 knots per square inch would take 4-5 artisans working 6 hours a day 6 days a week approximately 14 months to complete! How do I give my rug a major cleaning. Most rugs will not need major cleaning for at least 10-20 years. Do not use harsh chemicals or cleaners on the rugs as the chemicals may react with the dyes. This is especially important for natural dye rugs. Ten Thousand Villages cannot be held responsible for rugs cleaned with materials other than gentle soap and water. Although you can take your rug to an Oriental rug shop and have the people there arrange to have it cleaned, a quality handknotted Oriental rug can be washed in your driveway with regular soap. Using very little soap (regular clothes detergent, hair shampoo, etc. ), scrub down the rug with your fingers or feet and hose it down with water. Rinse very thoroughly as soap that is left in the carpet makes a very stiff pile. Squeegie the pile with your hands or with the side of a dustpan to remove excess water. Before washing, take note of the direction your rug pile is laying. After washing, with your hand brush the pile down in the direction it was lying before it was washed. The rug needs to be dried on a flat surface. Once the rug is dry, with your hands or with a vacuum cleaner, raise the pile by stroking/sweeping in the opposite direction. Our staff has also found a home-use carpet steam cleaner to work very nicely, using the approved cleaner soap. What is meant by "knots per square inch"? "Knots per square inch" refers to how many knots are packed into a square inch. Single-knotted rugs (most of the Bokharas and Tribals) have two strings in the same space that double-knotted rugs (Persians) would have four strings; hence twice the amount of knots. In a double-knotted rug, the second knot sits in front of the first knot and so is not visible from the back. More knots per square inch does not make a Persian rug a better rug than a Bokhara or Tribal rug. Persians, Bokharas and Tribals are simply done in different ways. The basic difference between Bokharas, Tribals and Persians is similar to the difference between appliqued and patched quilts--same materials, same skills, just different techniques. If good materials are used and there is good craftspersonship, then there will be a good rug. A Persian might last a bit longer than a Bokhara, but with an average life span of between 100-200 years, it becomes a moot point. What determines the price of a rug? The cost of each rug is based on labor involved, raw materials used and size of the rug. Persian rugs generally are more labor-intensive with more raw materials and therefore are higher priced. The final price from the artisan group represents 70% labor, 25% material, and 5% shipping. The artisan group receives from 60-63% of the rug's retail. What are the differences between �hand-knotted� rugs, �hand-made� rugs, �tufted� rugs, �machine-made� rugs and �wall-to-wall� carpeting? "Machine-made" rugs, as the name suggests, are made by machine - not by hand. "Wall-to-wall" carpeting is not as durable as a hand-knotted rug, because its backing is glued to the foundation; knotting does not occur. Should I accept noticeable �flaws� in a hand-made rug? As with any other hand-made item, hand-knotted rugs are sometimes less than precise and this may add to their appeal. However, what may be a tolerable imperfection to one person may be unacceptable to another. For example, one rug may have crooked edges, white knots or contain areas of abrash. These conditions are not necessarily "flaws", and what may be considered a flaw in one type of rug may be considered characteristic of a different type of rug. Only you can determine whether a rug will be suitable in your home, given any minor imperfections that may exist. What are those bands of uneven color in my Oriental rug? A change in color in the field and/or border of your rug is called "abrash" and is due to differences in wool or dye batches used in the weaving of your rug. The color change extends across the rug, left to right, following a weft yarn. Rather than view abrash as a rug flaw, many rug admirers value this condition as an artful hallmark of a hand-woven rug. Many machine-made rugs are now emulating this abrash effect to give the appearance of a hand-made rug. The fringes on hand-knotted rugs are an extension of the foundation warp yarns of the rug. Because the fringes lie directly on the floor they are not protected from foot impact and abrasion like the pile of the rug. Also, a common practice with many modern Oriental rugs is the "chemical washing" of the rug after weaving is completed. The rugs are saturated with a chlorine bleach solution to mute the colors and/or give the wool a shiny appearance. The rug is then rinsed with an acid solution to prevent yellowing. This procedure is repeated several time until the desired effect is achieved. This process does some limited damage to the wool pile but has a harsher effect on the fringe, actually weakening the fiber. This pre-existing fringe damage is often not noticed until after the rug has been cleaned and pieces of fringe are noticeably absent. Prior to cleaning, a build-up of soils can act like an adhesive to hold broken pieces of the fringe in place until the cleaning process removes the sticky soil residue. The small, broken fibers are then free to slide apart and the fringe sheds rapidly. If you gently tug on the fringes of your rug before cleaning, you may find the fiber comes apart easily. At this point the only remedy is to replace the weakened fringe fiber by weaving in new, untreated and undamaged fringe yarn. When you have a rug repair concern, call us for a free repair evaluation. Almost every interior textile will lighten in color or "fade" over a period of time. The extent of damage depends on the item's location, exposure to light and elements, color, intensity, type of dyes and the dyeing method used. The sun (and other sources of light and fumes) may fade the colors of your specialty rug, especially if the rug is placed in an intensely bright location. To minimize this problem, prevent prolonged exposure to intense sunlight by keeping the windows covered or treating them with a protective coating that filters out the ultra-violet (UV) rays of sunlight. You may also wish to simply rotate your rug every three months. What is the difference between a Persian rug and a "Persian design" rug? The names of Oriental rugs are often difficult to pronounce and confusing to many. They conjure up images of faraway lands and exotic locales such as Sarouk, Kashan, Kerman, Bokhara, Peking, Samarkand, Heriz and Tabriz. The names originally referred to the cities, villages or nomadic tribe which specialized in a specific rug weave, pattern or quality. But using the cities to identify specific rug styles is no longer a rule of thumb since many patterns are now woven in cities - and countries - other than their origin. The names are now more useful in describing a pattern than discovering the area where the rug was made. Today, many rug names include a prefix that identifies their country of origin. For example, the rug name "Indo-Kashan" describes a rug with a Kashan design made in India, whereas a "Sino-Tabriz" is a Tabriz design made in China. This is not always the case, however, as new designs are sometimes given their own names by the wholesale rug companies that have them produced. Why does my Oriental or specialty rug look different from one end to the other? Each rug has a "light" side and a "dark" side, depending on whether one looks into the nap or with the nap. The color intensity you see from one end of the rug may be vastly different from what you see on the opposite end.